Indian Foreign Service (1979; Retired); Former Deputy National Security Adviser and Secretary, National Security Council Secretariat (NSCS), (2014-17); Joint Secretary, NSCS on deputation from Ministry of External Affairs; 1999-2007. Dealt with a wide range of national security issues within the NSC structures. Had wide ranging interaction in official capacity with delegations of other countries. 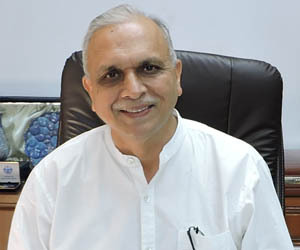 Former Director General, Institute for Defence Studies and Analysis (IDSA), New Delhi (2012-14); Lal Bahadur Shastri Chair National Security, IDSA, 2008-2011. Conducted track 2 level interactions with think tanks of other countries. IDSA is entirely funded by the Ministry of Defence. Served in Indian diplomatic missions in Moscow, London, and Ankara. Dealt with Afghanistan, Kashmir, Soviet Union, Russia, and Central Asia in the Ministry of External Affairs. MSc (Physics), Delhi University (1974); Visiting Member Tata Institute of Fundamental Research (1974-76). M.Phil (1988) and PhD, School of International Studies JNU (1991); Interested in problems of national and international security; foreign policy, issues of defence strategy; ancient Indian thought; nation building, science and technology etc. Has written four books and co-edited several. His book How India Manages Its National Security was published by Penguin Random House in 2018. Former Deputy National Security Adviser and Secretary, National Security Council Secretariat (NSCS), (2014-17); Joint Secretary, NSCS on deputation from Ministry of External Affairs; 1999-2007. Dealt with a wide range of national security issues within the NSC structures. Had wide ranging interaction in official capacity with delegations of other countries. Former Director General, Institute for Defence Studies and Analysis (IDSA), New Delhi (2012-14); Lal Bahadur Shastri Chair National Security, IDSA, 2008-2011. Conducted track 2 level interactions with think tanks of other countries. IDSA is entirely funded by the Ministry of Defence. Served in Indian diplomatic missions in Moscow, London, and Ankara. Dealt with Afghanistan, Kashmir, Soviet Union, Russia, and Central Asia in the Ministry of External Affairs. Interested in problems of national and international security; foreign policy, issues of defence strategy; ancient Indian thought; nation building, science and technology etc. Has written four books and co-edited several. His book How India Manages Its National Security was published by Penguin Random House in 2018. इमरान खान का पुलवामा पर बयान: क्या भारत, इरान और अफगानिस्तान एक संयुक्त वक्तव्य जारी कर सकते है?